The Virginia Tech shooter [Cho Seung-Hui] had the words "Ismail Ax" written in red ink on his arm, according to this blog from the Chicago Tribune. What does that mean? A google search shows nothing. Maybe the readers of Boing Boing could shed some light on this? -Ismail is an Islamic prophet. -AX may also stand for the Alpha Chi Omega womens fraternity, which I found does have a chapter at Virginia Tech. Any other ideas? I know in the grand scheme of things, it's irrelevant, but for me, trying to shed some light on the psychology of the person responsible for tragedy is a way of dealing. I found this photo dated August 1, 2006 on Flickr. Caption: "He's a South Korean. Ismail is not his real name. He use it because his name is very hard to pronounce, especially for Indonesian people. His real name is Cho Seung Hoo ....... or is it Jo Sung Ho?" Elda Rossell, the user who posted the photo on Flicker has a blog entry at this link regarding Ismail. Can anyone translate? He may have been trying to write the name "Ishmael." Wikipedia notes: "The name has come to symbolize orphans, exiles, and social outcasts." He left his father after he lost hope to convert him to the right path, and directed his efforts towards the people of the town, but they rejected his call and threatened him. By Allah, he said, I shall plot a plan to destroy their idols. He knew that a big celebration was coming soon, where everybody would leave town for a big feast on the riverbank. After making sure that nobody was left in town, Ibrahim went towards the temple armed with an ax. Statues of all shapes and sizes were sitting there adorned with decorations. Plates of food were offered to them, but the food was untouched. "Well, why don’t you eat? The food is getting cold." He said to the statues, joking; then with his axe he destroyed all the statues except one, the biggest of them. He hung the ax around its neck and left. The conspiracist side of me notes that the semi-legendary Hashshashin (from which we get the word assassin) were Ismailis, a subsect of the Shi'a. Fans of William S. Burroughs and Robert Anton Wilson will be familiar with the assassins of Hasan Sabah. Here's a link to a page about the Ismailis and the Assasins (scroll down). It's probably just a coincidence, but I thought I'd throw it into the mix. Thanks for your excellent reporting. This guy seems to have found a fairly convinving explanation. Especially if it turns out that Seung-Hui was Muslim. Ismail was Ibrahim's son. It was Ismail that Ibrahim wanted to sacrifice for Yahweh (with an ax)." Just sy was finished chatted with one of the guests WH. he South Koreans. His name of Ismail. Yep… you gak wrong read … his name of Ismail. Sy surprised also by the name of him, trus sy tny he, is it true that that his name. Evidently that his Indonesian name, the name in fact was Jo Sung Ho. He and several of his colleagues from KorSel, was studying Indonesian for 2 months in WH. after that he will go to Palembang to teach the computer in the TECHNICAL COLLEGE OF MACHINERY for 2 years. 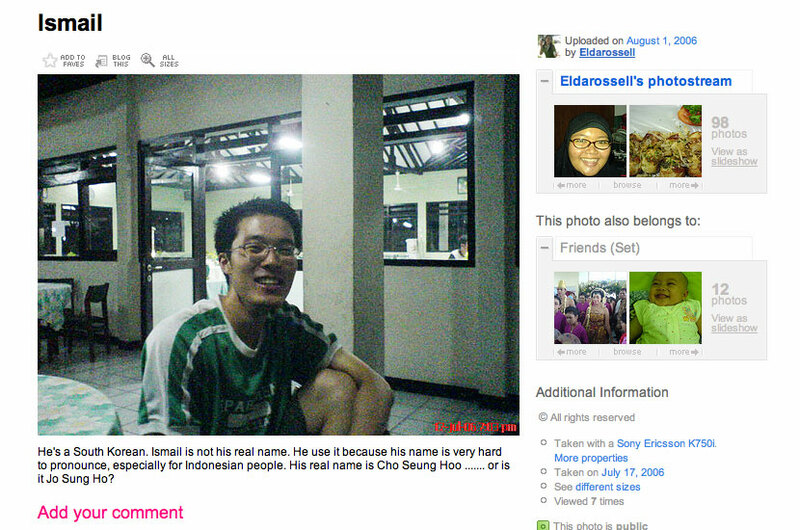 Ow, susye true chatted was the same Ismail/Sung Ho … because he was not yet fluent in Indonesian. Bhs England then only a little (sami mawon sm sy). But according to sy, he has been moderate could compared to his friends (sy sometimes still liked to laugh in view of the fact that his friend had difficulty really asked Indonesian). Trus sy every was the same Ismail, he must often chat with Indonesians yg was in WH. By the way the matter of the name, they were asked to choose the Indonesian name personally. Sy asked why Sung Ho chose the Ismail name, he every because he wanted to be friends with the person Islam. Trus he mentioned the veil, then mentioned the name of Ms Siam (one of the employees WH) that wore the veil. Sy also asked whether the Indonesian name his friends. Ismail mentioned Indra, the Torment … yep…ka you also were not wrong read … was yg his name the Torment, bayangin then! Sy, Mbak Rus and yg other agreed if the name must be replaced. Possibly sy tomorrow could speak first with Ismail ttg this because we janjian to chat again tomorrow night. Palembang is an Indonesian city. Googling KorSel Indonesia results in a team playing in badminton tournaments there. My interpretation is that this took place in Indonesia. Nothing about the shooter indicates he visited (much less studied or worked) there. So, I guess it's not the guy. Ishmael by E.D.E.N. Southworth [ aka Emma Dorothy Eliza Nevitte Southworth ]. very hard work, I get very good wages. as the sound of Ishmael's ax fell upon his ears. flushed with fever and his eyes wild with excitement. about," said Reuben, taking the ax from the boy's hand. "Ishmael, Ishmael, my lad, come in; you are not well enough to work,"
as he put his hand to his head and looked around himself in perplexity. Ishmael to the bed and laid him on it. "Oh, Reuben! what shall we do?" exclaimed Hannah. "I don't know, child! wait a bit and see." Link downloadable text of "Ishmael by Emma Dorothy Eliza Nevitte Southworth" at Project Gutenberg.